American sculptor George Grey Barnard is largely responsible for the art collection in The Cloisters, the branch of the Metropolitan Museum of Art located in Upper Manhattan. Barnard was a great collector of medieval and Gothic art, and he was adamant that it be displayed in a suitable setting. On his trips to Europe, in addition to collecting ancient artwork, he also transported pieces of European cloisters to New York, and built a private museum in Washington Heights. That museum was eventually purchased by John D. Rockefeller, Jr. in 1925. Rockefeller added his own sizable collection to Barnard’s until he eventually needed a larger space, so he donated a four-acre plot of his land in northern Manhattan. The construction of the current Cloisters, which opened in 1938, began. Fulfilling Barnard’s wish to display medieval art in a medieval setting, The Cloisters was designed in the style of the Romanesque and Gothic periods. Inside, the building is a patchwork of structures—a doorway from an abbey in Burgundy, a limestone wall from a church near Bordeaux, a 15th century oak door from Limoges—from five different French monasteries dating back to the Middle Ages. The Cloisters is a journey through the centuries, but the museum is manageable to get through in less than two hours. It tends to be popular with local school groups during the week, but it’s spacious enough where you don’t feel crowded out. Your approach could be leisurely. You could just stroll through the galleries and see what you see, enjoying the high arched ceilings and the daylight that streams in through the stained glass windows. Maybe step out into the gardens if it’s a nice day. Or, if you’d like a more structured approach, grab a map at the entrance and view the art chronologically, beginning with the Romanesque Hall on the first floor. Whatever your style, there are a few things you want to be sure not to miss. 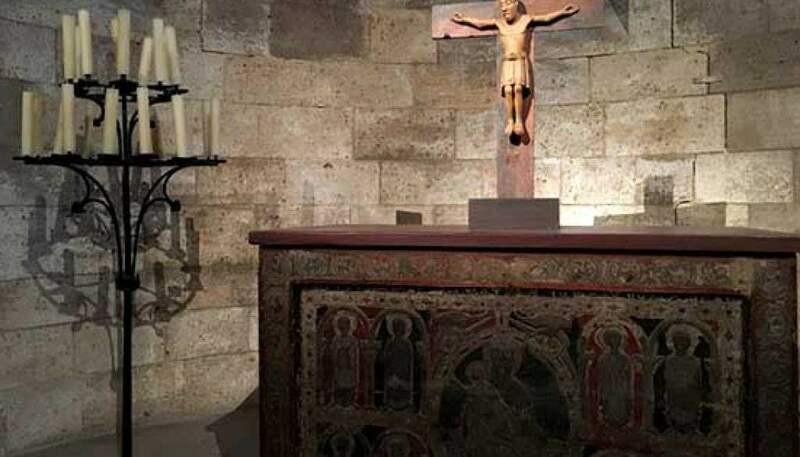 Langon Chapel is truly symbolic of the eclectic medieval medley that The Cloisters represents. Religious and royal figures are carved into the 13th century doorway, and artifacts inside the chapel include an ancient statue of Virgin and Child, carved out of walnut, and a 12th century crucifix that comes from the vicinity of Salzburg, Austria. Also very interesting is the Gothic Chapel on the ground floor, which contains tomb effigies from the 13th and 14th centuries, carved in limestone with elaborate detail. The grand masterpiece of The Cloisters, the one exhibit that can’t be missed, is the Unicorn Tapestries collection. The Unicorn Tapestries have always been somewhat of a mystery in the art world. Critics have long debated whether the series of seven tapestries, woven from wool, silk, and metallic threads, are meant to tell a chronological story, and whether the central figure in the story, the unicorn, is meant to symbolize Christ. Although the tapestries are thought to have been created between 1495 and 1505, their first recorded mention is in the 1680s, when they belonged to a family from the French nobility. They were looted during the French Revolution, eventually returned to the family, and then sold in the 20th century. Rockefeller purchased them for around a million dollars (a lot more money a century ago! ), and they hung in his home until he donated them to the Cloisters. Cost of Admission: The Cloisters is part of the Metropolitan Museum of Art and both great institutions work on a “suggested donation” model, which is $25 for adults. Hours of Operation: Open 7 days. – By subway: Take the A train uptown to the 190th street station, then walk north along Margaret Corbin Drive for about 10 minutes. – By bus: Take the M4 bus heading north to the last stop. If coming from the Met, head to Madison Avenue and 83rd street to get the M4. Be sure to check out the beautiful garden at The Cloisters, especially in the warmer months. And you’ll find it hard to believe you’re still on the island of Manhattan if you explore the woodsy setting outside the museum. 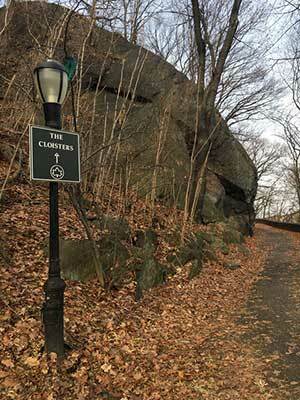 The Cloisters is located in Fort Tryon Park, whose creation is also credited to Rockefeller. He began to purchase land in this area in 1917, with a vision to create a green space for New Yorkers. To landscape the park, he enlisted the help of the Olmsted Brothers Firm, owned by the sons of Frederick Law Olmsted, famous for creating Central Park, Prospect Park, Morningside Park, and Riverside Park, just to name a few). Rockefeller dedicated Fort Tryon Park to the public in 1935. The view across the river, too, is thanks to a prominent and wealthy New Yorker. In 1901, J. Pierpont Morgan bought 12 miles of the New Jersey Palisades in order to environmentally secure the land from too much quarrying. Rockefeller then bought another 700 acres, so developers would never disrupt the view. Who says the Robber Barons didn’t give back? Fort Tryon Park and The Cloisters are two of the city’s most beautiful landmarks. They’re not exactly hidden gems, since both places are well-known to most New Yorkers. But because they are located far enough uptown—and many people don’t venture farther north than Central Park—they definitely qualify as off-the-beaten-path. Come here if you’re looking for a unique New York experience; you’ll be pleasantly surprised if you do. If you’re looking for a bite to eat after the museum or the park, New Leaf Restaurant and Bar is a short walk down the path from The Cloisters, and serves great food with views of the park.